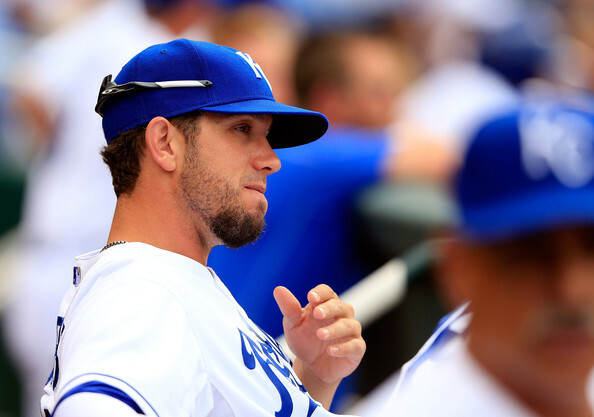 Stoking The Fire – Week 6: The ‘Royals’ MUST Sign James Shields To An Extension Right Away! Shields was brought into do a job (via trade) in the 2013 year, and he did just that, leading the American League In Innings Pitched, Game Starts – and Batters Faced – en route to a 13 – 9 year, with a 3.15 ERA. The Royals have him for an exercised $12.5 MIL Team Option in 2014, but the ALL – Star Pitcher has expressed interest in signing an extension long – term. My question is – why are they not backing up the Brinks truck right now? I have been writing for this fine website for a few weeks now. 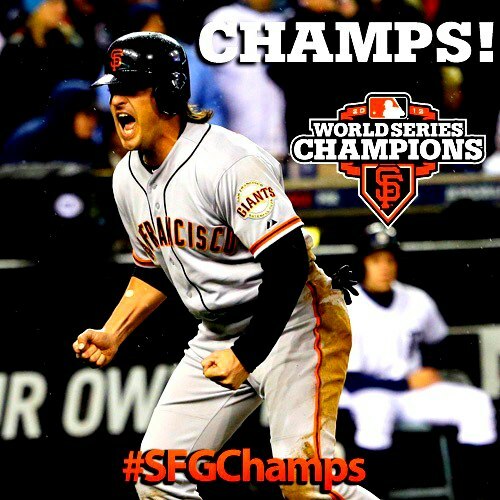 I must say that I have been bored with my bleeping mind since the World Series – from lack of excitement. 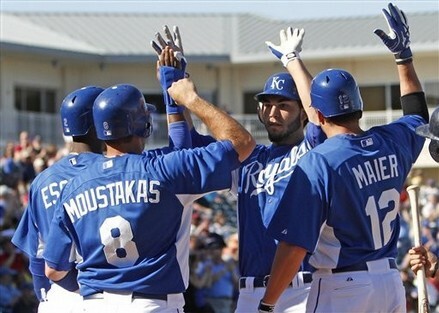 One of my 1st articles a few weeks back, also addressed the Kansas City Royals need to go for it in 2014. It is not time to sit back any longer. At the end of this post, I will provide a link to read that post too. 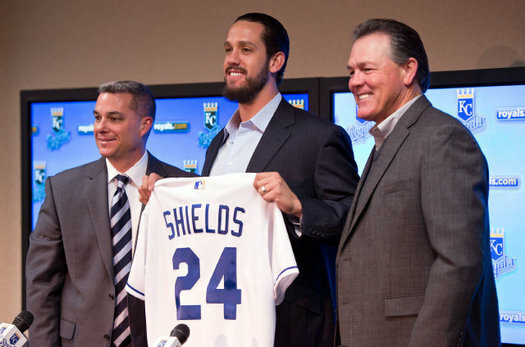 I was commuting to my business last week, and I heard that James Shields likes it in KC – and would be willing to stay long-term if possible. Okay, so why aren’t David Glass and Dayton Moore at Shields house right now, hammering away on an extension deal? James Shields turned in a workman like effort for the Royals (13 – 9, with a 3.15 ERA – AL leading 228.2 IP and 34 Game Starts) – only to have received little run support. With the Trade having going down seemingly to correct each other main ailments with the Rays needing offense and the Royals needing defense. It has worked for both teams. 2014 becomes the most pivotal year in the last 3 decades for the franchise – as it is “Big Game” James’ last year under contract. With them trading away Wil Myers for his services, the team needs to capitalize on this year. Ultimately the franchise should spend any amount of $$$ necessary in 2014 to compete with the big boys of the AL. With so many of their own core young players due to start receiving salaries increases, this next year has to be the time to go for it!! I am officially calling out the Royals Management and ownership to buck up again for the 2014 season. If ever there was a year to spend the money it is now! You have James Shields for one more year, and all of your core young players like Billy Butler, Eric Hosmer, Luke Hochevar and Mike Moustakas are heading for some payraises in the near future for Arbitration. Wade Davis also will see his money bumped in 2015. The time to win is now! The First Three Months Look At The Wil Myers And James Shields Deal – Who Is Leading? James Shields has turned in a workman like effort for the Royals – only to have received little run support to help him with his Won – Loss Record. With the Trade having going down seemingly to correct each other main ailments with the Rays needing offense and the Royals needing defense, it has worked for both teams yet exposed a weakness that used to be a strength in the process. The Rays have done it for the majority without Myers – where as Shields is on pace for another 200+ IP. Now the Royals can’t hit and the Rays pitching has gone south. One is left to wonder – what if the trade never took place? It just will not go away. The risky trade orchestrated by General Manager Dayton Moore this past offseason between the Royals and Rays deserves revisiting with Tampa Bay’s recent call-up of Wil Myers, the fourth-overall prospect according to MLB.com. Admittedly, the ultimate victor of the trade will not be decided for years, as it most likely hinges upon Myers’ development and ascension as a player. However, with virtually half of the 2013 season completed and looking at the now instead of the future, and this deal was undoubtedly for the now from the Royals perspective, the early returns are slanted in favor of the Royals.